Athens is an ancient place which was established two thousand years ago. It`s a boring place to live. Paris is beautiful in spring. New York is a bustling place, the city that never sleeps. This fort is a charming place which is steeped in history. Quaint: attractively unusual or old-fashioned. 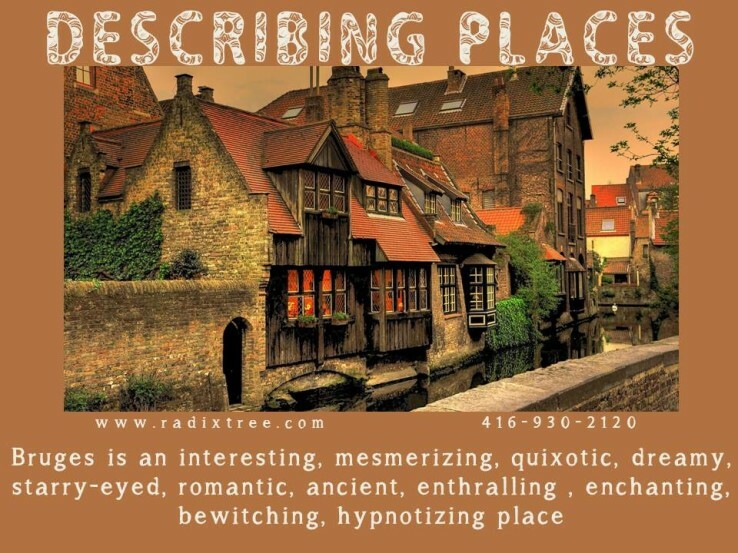 Picturesque: (of a place or building) visually attractive, especially in a quaint or charming way. Durham is a compact city, you don`t need a transport to travel around. I need a contemporary decor of my room. Liverpool is a cosmopolitan and culturally diverse city. In few years this mall has become notable. Our live online classes with Experienced teachers are just like being in a real classroom, but you’ll be learning from the comfort of your home. You can ask a question, make comments, and interact with your teacher and fellow students. earn topics in a pleasant and entertaining atmosphere. Learn more about describing words and how to improve your speaking skills by joining our Live Virtual Classrooms. Avail your 30 min demo class .. No charges for trial class … Avail your Chance Today !